Bamboo Dancers are a subset of Spear Guys that do the Bamboo Dance. While Dancing Spear Guys jump around with spears, Bamboo Dancers always come in color-coded pairs and dance with limbo sticks. Their stick can trip Yoshis and lower their happiness, so it must be jumped over to avoid damage. During gameplay, one dancer is in the foreground while the other is in the background, making them invincible. 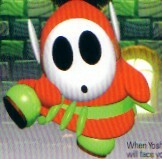 Bamboo Dancers only appear as enemies in Yoshi's Story, and only in Stage 5-3: Shy Guy Limbo. They also make a cameo appearance in both Mario Party and Mario Party 2. The artwork and sprites for Bamboo Dancers appear quite differently, as the sprites appear to be wearing yellow face paint and grass skirts in the same manner as Spear Guys, while the artwork depicts one with an unpainted mask and a much less leafy skirt. In addition, their shoes are green in the artwork instead of blue. In the Japanese version of Mario Party Advance, Hulu is identified as a Bamboo Dancer, despite looking much more like a Dancing Spear Guy. This page was last edited on November 23, 2018, at 10:30.